digging a path on the sidewalk next to the side garden. Winter blues can set in heavily around this time of year for those of us in cold and snowy climates. Our gardens are bare, the world outside alternates between frozen and just plain wet--but always frigid--and some days the sun never comes out. Many people become very depressed in the dead of winter and for good reason. The Ojibway Indians called the month of February the Hunger Moon, as their food stores from the summer and autumn dwindled, game could be difficult to find, and fresh food was only a distant memory. Though I have the treasured ability to get fresh vegetables year round from the grocery store, my heart hungers for my own veggies. Hunger Moon is the last leg of the winter marathon; we know that the chill will be gone soon, and that suddenly it will be warm and green once again, but getting to the end means focusing hard, with steel resolve. Our physical survival may not be at stake like it was for the Ojibway, but our mental and emotional endurance can be challenged in very real ways. Though the snow is oppressive, and the bare branches on trees are dismal, there is a really great aspect to winter, and a huge incentive for walking around and quietly observing your little homestead. The landscape has been wiped clean! A clean white canvas lies before you, and vivid images emerge; of garden beds, and pots, and spirals, all filled and lush with green growing food. And flowers, too, of course! If you are like me and working with a small suburban lot, where every inch of space has potential, the clean slate is very encouraging and exciting. When living on a little lot, there is no such thing as wide open spaces...yet, when the snow erases all the imperfections below, the space seems so much bigger. Projects start to form in my mind every time I go outside in the winter snow. The layout of new beds, additions to old growing areas, and novel ideas come alive in my head like no other time. In summer it's sometimes overwhelming to make new plans. My backyard has several areas that always become wildly overgrown, remnants of a previous owner's landscape dreams that now have become a nightmare to keep at bay (*note to self: never, ever, ever plant decorative vines. EVER). In winter, however, the vines are dead, unwanted wild shrubberies are bare and it's easy to visualize cutting them down for firewood. Everything looks so bare and clean and easy to manipulate. it's easier to imagine ripping them out and putting garden spaces there. and some nice edible landscaping could be the start of a front-yard paradise! Sigh...be still my beating heart! the 1/6 acre empty lot. one day perhaps it will contain the little orchard and sprawling gardens I see in my mind. South side garden-against-the-house (our property ends there). and I've been coming up with various ideas ever since. Backyard from the far south corner. along the fence to the right (south)...the evidence is nearly erased by the snow! Oh, and that little brown shed? It WILL be a chicken coop! But not yet. Another view from the south corner. The ONE open space in the yard. but still leave some room to play in. Been mapping out various ideas, over and over! The other corner of the yard. Compost bin. We need another matching bin next to it to make faster and easier compost. much easier to deal with--we'll remove it and build another simple pallet bin. The north fence in the backyard has some potential. More brush to cut out, and narrow beds can go along the entire length. I love this little space between the back of the house and the shed. Since it is mostly shade, I've been experimenting with shade-loving plants. so I'm going to try lettuce, spinach, arugula...just lots of greens. The circle on the left shows an old playhouse we have really outgrown. It makes me sad to think of letting it go, but this could really open up some growing opportunity. In summer it gets overwhelmingly overgrown and completely in the way. that is our beloved mulberry tree! the idea of cutting it all out. I'll be honest though...this project seems huge and scary. a lot of gnarly stuff growing there. Finally, the back patio. The wall faces south and gets tons of light each day. A gutter is right overhead. I'm thinking of a system of Earth Buckets for this spot. Actually getting these projects started? Much less, finished?! Ohh, that is the hard part! Dreaming is fun...doing takes discipline. I know that I'm going to have to prioritize what I want done the most, so I don't jump in and make a bunch of messes that never get completed. Things will be picking up indoors as I start the garden's seedlings, and start making plans for summer (a very, very busy time for my daycare). Life in all other areas never seems to slow down (don't we ALL know that). 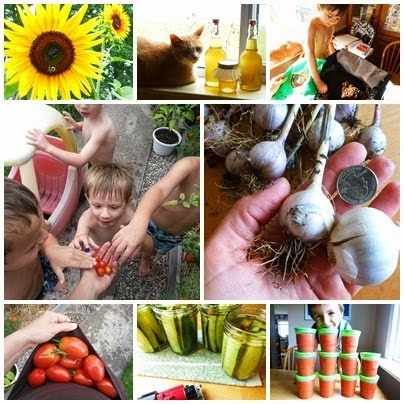 Can't I just be a full-time gardener and homesteader...please??? ;) Finding the time and the motivation to make these ideas come alive will take some will power, especially when the snow melts and reveals all the imperfections in the yard; the vines--oh shoot me now, the vines. The overgrowth, the pesky unwanted plants. If I can commit to taking care of the cleanup before everything starts exploding with green, then hopefully I can expand and evolve some areas around this little homestead into valuable growing spaces! Stay tuned, and please share: What have you imagined in your blank slate this winter? Do you have a project or two in mind for your garden this spring? I cant imagine how cold it must feel. I think Garren has only been once to see the snow and I think that was about 3 years back?? Only because the snow was close enough for us to get up into the Drakensburg. I love your plans you have going all up in your head- and I do hope you persevere and go forward with them! While you are most certainly welcoming in the warmer months, we down in the Southern Hemisphere are welcoming in cooler months too! Thank you so much for stopping by, and for the kind words, Angie! Oh, planning is half the fun! If I may offer one suggestion...place your raised beds and gutter garden near a water source. And thinking of your wonderful blank canvas... I can envision what your garden spot would look like....and it would be so cute framed in a little picket fence with a grapevine arbor entrance! !.....Can you see it? Lol...I can! Sandy, how did climb into my brain??? Seriously, a little picket fence and arbor entrance...it's the garden space of my dreams! :) Thank you for the water tip, too. So nice to 'see' you here! We are suburban homesteaders, too. Dreams! Dreams! * list all your dreams for your plot, and decide to do one or two a season. That way it doesn't get too overwhelming. *do the ones that need time to mature first - such as adding espaliered fruit trees, the LOVELY idea of fruit bushes along the back fence, maybe an asparagus bed. Consider rosa rugosa bushes, too, for their rose hips? *Use the best materials you can afford. Buy the best local nursery stock you can afford. How blessed you are to be doing this at a young age. We didn't start until in our 50's, and it's harder work at that age! How blessed are your littles to grow up with growing things, with good food, and parents such as you. Oh, yes! those overgrown bushes out front? Yep, tear them out! YEA! Go for it!